THE MEANING OF VETERANS DAY: A celebration to honor America’s veterans for their patriotism, love of country, and willingness to serve and sacrifice for the common good. We would like to say a special “Thank You” from MilitaryBridge to all military members past, present, and future for your amazing dedication and sacrifices you and your families make every day to protect our freedom! 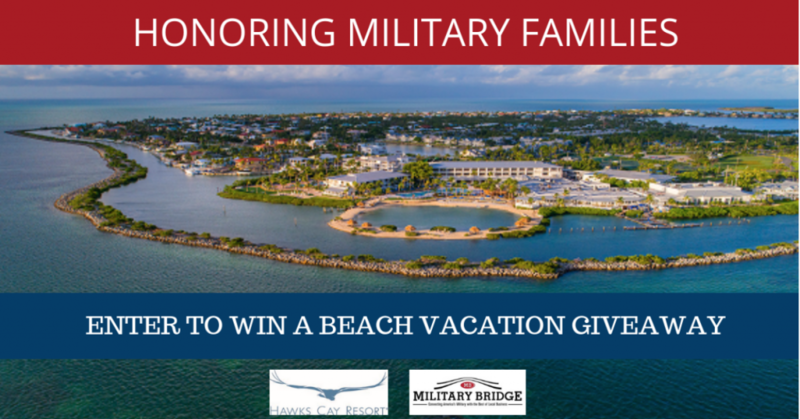 (1) In Collaboration with MilitaryBridge, Hawks Cay Resort, located in Duck Key, Florida is Proud to Show their Appreciation of the Military Community this Veterans Day and Military Family Appreciation Month with a Florida Keys Vacation Giveaway! Enter to win a 4-night stay in one of Hawks Cay beautifully renovated guest rooms, Hotel Accommodations included for a family of 4, Daily breakfast at the new Hawks Cay Marketplace and A Dolphin Connection experience for the entire family! (4) In honor of Veterans Day & Military Golfers, TaylorMade in collaboration with MilitaryBridge is giving away a TaylorMade MySpider Personalized Putter. Choose from Red, White & Blue. This giveaway will run November 1-11th, 2018. From October 15 to November 15, you can enter daily to win one of 12 SleepIQ™ Kids beds. Learn more & enter here! (2) Blue Star Families & Caulipower team up! Caulipower giveaway & discount–Grab an exclusive coupon for $3 off CAULIPOWER. Share your special creations on Instagram, tagging @CAULIPOWERED, @BlueStarFamilies and #WhatTheBraveCrave for a chance to win a year’s worth of pizza. For every tagged entry, we’ll donate $1 to Blue Star Families (up to $10k). Learn more and enter here! Disclosure: Some of the following listings are sponsored or contain affiliate links meaning MilitaryBridge may receive a small commission when you purchase from some online retailers. McCormick & Schmick’s Seafood Restaurants: McCormick & Schmick’s locations nationwide wants to take the opportunity to honor those who have served and are still serving in the United States Military. Sunday, November 11th military members Active Duty, National Guard, Veterans and Gold Star Honorees (parents and spouse) enjoy a Free Entree for Lunch or Dinner. Reservations recommended! McCormick & Kuletos (California): McCormick & Kuleto’s wants to take the opportunity to honor those who have served and are still serving in the United States Military. Sunday, November 11th military members Active Duty, National Guard, Veterans and Gold Star Honorees (parents and spouse) enjoy a Free Entree for Lunch or Dinner. Reservations recommended. McCormick Fish House: (Oregon) McCormick FIsh House wants to take the opportunity to honor those who have served and are still serving in the United States Military. Sunday, November 11th military members Active Duty, National Guard, Veterans and Gold Star Honorees (parents and spouse) enjoy a Free Entree for Lunch or Dinner. Reservations recommended. Jake’s Grill: (Oregon) Jake’s Grill wants to take the opportunity to honor those who have served and are still serving in the United States Military. Sunday, November 11th military members Active Duty, National Guard, Veterans and Gold Star Honorees (parents and spouse) enjoy a Free Entree for Lunch or Dinner. Twin Peaks: In Honor of Veterans Day, Twin Peaks Sports Bar & Restaurant Locations Nationwide are Offering a Free Meal from a Select Menu on November 12, 2018! In addition, we are also running a Give $5, Get $5 promotion in conjunction with Veterans Day to give back through our national nonprofit charity, Folds of Honor. TGI FRIDAYS: In recognition of Service, Sun. Nov. 11 – Mon. Nov. 12, current military members and Veterans with valid identification enjoy a Free entrée up to $12 all day, no purchase needed. Military members who dine with us on Nov. 11 and 12 will get the code “TGIVETS” at the bottom of their bill. Between Tues. Nov. 13 and Fri. Nov. 30, they will be eligible to order a free personal-sized appetizer with any online/to-go purchase of $20 or more. Also, be sure to enter the #FridaysSalutes giveaway above for a chance to win a $50 gift card. Moe’s Southwest Grill (Hampton Roads): In honor of Veterans Day, Moe’s Southwest Grill locations in Hampton Roads will offer a special military discount on Nov. 11 and Kids Eat Free. Plus, stop in on Saturdays for their 20% military discount or Mondays for their specially priced burrito. WORX Tools: In honor of Veterans Day, from November 10-12, 2018, veterans enjoy a 11% off sitewide sale and an additional discount off 10% off (with code WXVETERAN10) for our registered Veterans, for a total of 21% off! Get registered here! International Spy Museum: The Spy Museum is excited to welcome Veterans from November 4-18, 2018 for a discounted price of $14.00 plus tax (Walk up price $22.95). Don’t miss your last chance to see the Spy Museum’s current exhibition including the interactive exhibit, Exquisitely Evil, featuring James Bond’s chief adversaries, their henchmen, lairs, and weapons. Paragon Theaters: Paragon Theaters is Proud to Show their Support of the Military Community this Veterans Day with a Free Small Popcorn! Catch a movie and enjoy a free popcorn on Veterans Day! Aquarium of the Pacific: Free admission for military members and veterans with id on Veterans Day 2018. LEGOLAND Florida: In Honor of Veterans Day, LEGOLAND Florida is Offering FREE ADMISSION, FREE PARKING, HOTEL DISCOUNTS & GUEST DISCOUNTS for the Month of November! Holt’s Cigar Company: This Veterans Day and everyday, Holt’s Cigar Company is Proud to Offer a 10% Military Discount in Appreciation of Military Service. Shop the Finest Cigars Since 1898! Helzberg Diamonds: Helzberg Diamonds is Honored to Play a Role in Military Families’ Life Moments. In Appreciation, Helzberg Diamonds Offers a 10% Military Discount! TOMS: In Honor of Veterans Day, TOMS is Increasing their Everyday Military Discount to 20% Off November 1-18, 2018! Buckle: Buckle is Proud to Show their Support of the Military Community this Veterans Day and everyday with their 10% Military Discount Program! Plus, Free Shipping November 5-20, 2018. Smile Doctor Braces: In honor of Veterans Day and everyday, Military members & their families enjoy a 10% Military Discount on orthodontic services. vineyard vines: In honor of Veterans Day and everyday, military members enjoy a 15% military discount. Plus, in honor of Veterans Day, vineyard vines will donate 20% off the proceeds BACK to K9s For Warriors from each purchase of a limited-edition Veterans Day Long-Sleeve Pocket T-Shirt. Texas de Brazil: Join Texas de Brazil this Veterans Day, November 11, and Enjoy this Offer: 2 veterans per table dine complimentary plus 20% off for up to 6 additional guests. The Greene Turtle: This Veterans Day, The Greene Turtle Would Like To Honor Our Military Active Duty & Veterans With A Special Discount on Veterans Day. Up to $12 off your meal from their regular menu. Ex: If an entree costs $14.00 you only pay $2. It the item costs $11.99, you pay nothing. This offer is available at participating locations nationwide. Learn more about The Greene Turtle year-round military discounts on the link provided. BAR LOUIE: This Veterans Day, participating Bar Louie locations will offer a free burger or flatbread up to $15 for all active duty or military veteran with proof of service. Plus, Bar Louie is raising money from 11/5-11/12 with 100% of the proceeds helping Veterans and Families in need for OperationHomefront.org. A guest has the option to donate a dollar amount to their check. Tucanos Brazilian Grill: November 9,10,12 (closed on Sundays), Tucanos Brazilian Grill is providing a special “Thank You” to military heroes. All ten locations will offer active duty, reserve and retired military veterans a complimentary churrasco meal with the purchase of another adult churrasco meal. Veterans dining single will receive a 50% discount off their meal. In addition, guests are encouraged to post a selfie taken at Tucanos to receive a Free Dessert Certificate to use at your next visit. Cafe Rio: In honor of Veterans Day, Cafe Rio will offer a 50% military discount to Veterans and their families on Sunday, Nov. 11 and Monday, Nov. 12. Cafe Rio also offers generous everyday military discounts, visit their link to learn more. Uno Chicago Grill: Veterans Day BOGO offer (Free entree or individual pizza with the purchase of an entree or pizza of equal or greater value) on Sunday, 11/11, 2018. Olive Garden: On Veterans Day, Olive Garden restaurants will offer a free entrée from a special menu to active-duty military and military veterans. The special menu features several of Olive Garden’s most popular items. Entrees are served with unlimited homemade soup or famous house salad and warm, garlic breadsticks. Fogo de Chão Churrascaria: Veterans enjoy 50% off your meal on Veterans Day Weekend, Friday 11/9- Sunday 11/11. In addition, up to 3 guests per military veteran or active duty personnel may receive 10% off their meal. Offer Valid Friday 11/9/2018-Sunday 11/11/2018 at any US or Puerto Rico Fogo de Chão location. 50% off food only for military veterans and active duty personnel. Must present Military ID, DOD ID, DVA ID or DD214 ID to receive discount. 10% off food only for up to 3 guests for each military veteran or active duty personnel. Alcoholic and non-alcoholic beverages, dessert, tax and gratuity not included. Not valid with any other offer, discount or prior purchase. Non-transferable or for resale. Shane’s Rib Shack: November 8-10, 2018, Free Sandwich Combo at participating locations. GOLDEN CORRAL: Golden Corral’s annual Military Appreciation Night dinner will be held on Monday, November 12, 2018, from 5 to 9 pm in all Golden Corral restaurants nationwide. The FREE dinner meal is a special “thank you tribute” to any person who has ever served in the United States Military. If you are a veteran, retired, currently serving, in the National Guard or Reserves, you are invited to join us for Golden Corral’s Military Appreciation dinner. Black Angus Steakhouse: On Monday, November 12th, 2018 across 43 locations in both our dining room and bar from open to close. All veterans and active duty personnel can get a special Certified Angus Beef Top Sirloin Steak, with mashed potatoes, fresh broccoli with garlic butter and a non-alcoholic beverage for $9.99 with proof of service. Dine in only. One offer per veteran or active duty military personnel. Excludes tax & gratuity. Can’t be combined with other offers. CHILI’S: FREE meal, Veterans Day, Nov 11, 2018 from 11am-5pm. Chili’s is offering a free entree from the Veterans Day menu to veterans or active duty military members. 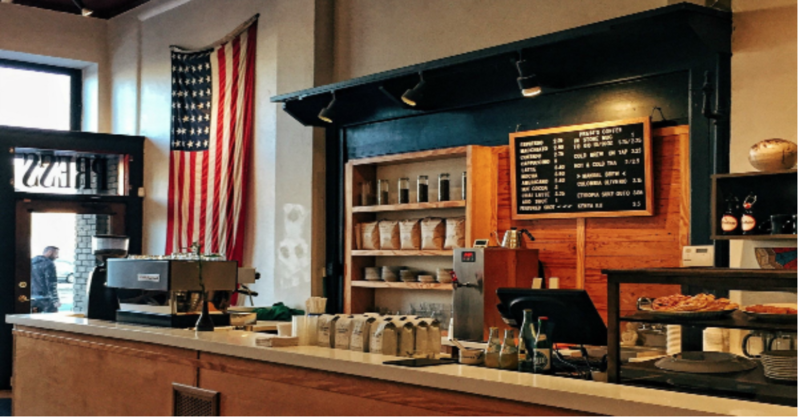 You’ll need to show proof of military service to get your free Veterans Day meal. Bubba’s 33: (waiting verification) Veterans and active members of the military get a free lunch on Veterans Day. Wienerschnitzel: Veterans and active duty military receive a free Chili Dog, small fries and a small pepsi on November 11, 2018 at participating locations with a military id. Burntwood Tavern M Italian and Tose Italian Kitchen: All Locations, Veterans and Active military get a free lunch or dinner on November 12, 2018 for Veterans Day. Lone Star Steakhouse: (waiting verification) All Veterans and Active duty military will receive a FREE ENTREE from the Stars & Stripes Menu with a military id. call ahead for participating locations. In addition, 10% of all proceeds on Veterans Day will be donated to SnowballExpress.org to help serve the children of our fallen heroes. TEXAS ROADHOUSE: FREE Lunch, Veterans Day, Sunday, Nov 11, 2018 from 11am-2pm. Offer is valid for active duty, retired, or former U.S. military. All veterans can choose from a select menu. Proof of service required. Grub Burger Bar: In honor of Veterans Day, active duty, veterans and retired enjoy a FREE ENTREE with proof of service. Mission BBQ: Veterans and active duty will receive a FREE sandwich and cake on Veterans Day, November 11, 2018. Hickory Tavern: On Veterans Day, veterans and active duty military enjoy a Free Tavern Burger with the purchase of a beverage. dine-in only, restrictions may apply. Back Yard Burgers – (waiting verification) Free Classic Burger for Veterans and Active Duty Military on Saturday Nov. 11. Show military ID or dress in uniform. Cracker Barrel: Veterans get a complimentary slice of Double Chocolate Fudge Coca-Cola Cake or a Crafted Coffee on Veterans Day, Nov. 11th. Plus, learn more about their contributions to Operation Homefront. Tap House Grill: Active, inactive and retired military personnel get a complimentary meal (Dine-In Only) on Veterans Day, November 11, 2018 at Des Plaines, Palatine, Hanover Park, Lemont, Wheeling, St. Charles, Plainfield, Oswego locations. Famous Dave’s: On November 11-12, 2018, in honor of Veteran’s Day, Famous Dave’s would like to thank all former and current military personnel for their dedication and service to our country by offering a Free 2 Meat Combo served with choice of side and cornbread muffin. Proof of service required. Yard House: Veterans and active duty military receive a complimentary appetizer on November 11. KRISPY KREME DOUGHNUT: (waiting verification) Free doughnut and small coffee to all those who have served or currently are serving. Proof of military service required or those in uniform. Only at participating locations. BJ’s Restaurant: In honor or Veterans Day, November 11, 2018 active duty & veterans enjoy a FREE entree $12.95 or less, plus a free Dr. Pepper. Dine in only. White Castle: Free combo meal, including breakfast combos, for all veterans and active military on Veterans Day, November 11 and November 12, at participating locations. JJ’s Red Hots: (waiting verification) Veterans and active duty military get a FREE MEAL on Veterans Day 2017 including unlimited hot dogs, sausages, sides and non-alcoholic drinks all day at participating locations. City BBQ: Free Sandwich platter plus drink (Sandwich platter =any sandwich + 2 sides) on Veterans Day for active duty and veterans at participating locations. Glory Days Grill: (waiting verification) On Veterans Day, Free appetizer or boneless wings with a military id. Chuck E. Cheese: (waiting verification) This Veteran’s Day, Chuck E. Cheese’s will thank veterans for their service by offering one free personal 1-topping pizza to military veterans at all U.S. restaurants. The Veteran’s Day offer is good on Nov. 11, 2017 for retired service members with valid Military ID or proof of military service. Promo code #5500. CentraArchy Restaurants: Includes 8 CentraArchy Restaurants: New York Prime, California Dreaming, The Tavern at Phipps, Chophouse New Orleans, Carolina Roadhouse, Joey D’s Oak Room, Chophouse ’47, or Gulfstream Café on Sunday, November 11, 2018 with a valid military ID or proof of service to enjoy a free entrée from the regular dinner menu (excluding AQ items, Porterhouse, alcohol and tax, dine-in). Denny’s Restaurants: In honor of Veterans Day, on November 11 and November 12, active, retired and veterans with id enjoy a FREE Grand Slam 5am-noon. Sammy’s Woodfired Pizza & Grill: (waiting verification) On Veterans Day, offering two free appetizer choices. The choice is between complimentary hummus served with grilled herb flatbread or garlic cheese bread on November 11. MOD Pizza: (Waiting Confirmation)On Veterans Day, FREE Pizza or Salad for Veterans and Active Duty Military with id. LongHorn Steakhouse: Veterans and Active Duty are invited to enjoy a complimentary appetizer or dessert at LongHorn Steakhouse. Guests that dine with a veteran will also receive 10 percent off their meal. This offer will be available in-restaurant on November 11, 2018. Max & Erma’s: (waiting verification) Veterans and Active Military EAT FREE on Friday, November 11th. Complimentary meal includes a 1/2 lb. cheeseburger, endless seasoned fries, & a fountain drink. Rock and Brews: Free pulled pork sandwich or strawberry fields salad on November 12, 2018 for Veterans, Armed Forces and First Responders with id at participating locations. Fazoli’s: Free Spaghetti with Meat sauce or Marinara for Veterans and active military with coupon and with valid ID or while in uniform, on Veterans Day Nov. 11 at participating locations. On the Border Mexican Grill and Cantina: Free choose-2 combo meal with mexican rice and refried beans, along with tortilla chips and salsa for active and retired U.S. military on Sunday Nov. 11. Must show id. Dine-in only. Texas Corral: Free Meal from a select menu plus lemonade, iced tea, or coffee for active duty and veterans with proper id. Outback Steakhouse: Outback Steakhouse is honoring America’s military veterans by offering active duty military and veterans a free Bloomin’ Onion and a non-alcoholic beverage. This offer is available to Military Personnel and veterans with ID. Also receive 10% Heroes Discount for military and first responders off your purchase. Primanti Bros: In honor of Veterans day, veterans and active duty enjoy a Free Sandwich at participating locations. PDQ Restaurants: (Waiting Confirmation) On Veterans Day either a FREE sandwich or 3-piece chicken tender meal with id for veterans and military members with id. Red Lobster: (waiting confirmation)To thank Veterans, active duty military and reservists, Red Lobster will offer a free appetizer or dessert with a valid military ID on November 11th. Red Robin: (waiting verification) Free Red’s Tavern Double and Bottomless Steak Fries for all Red Robin guests with a military ID or proof of service. At a participating location. Friendly’s: On Veterans Day, Free Big-Two-Do® breakfast (choice of two slices of French toast, two buttermilk pancakes or two slices of toast; two strips of crispy bacon or two sausage links and two made-to-order farm fresh eggs), or All American Burger (fries and a beverage ) during lunch or dinner. Dine-in only. Limited to one per person. Offer available for active military and veterans with ID or discharge papers. Participating locations only. Hy-Vee: Free breakfast on Veterans Day from 7am-11am at Hy-Vee supermarkets with in-store dining. Call ahead for participating locations. Hooters: Hooters invites all veterans and current servicemen and women to a Hooters Veterans Day free meal from a select menu by presenting a military ID or proof of service at participating Hooters location across the country. Green Mill: In honor of Veterans Day, November 11, veterans enjoy a free menu item for lunch or dinner. Offer includes any single item from their menu, some limitations. Proof of service required, dine-in only. Cotton Patch Cafe: In honor of Veterans Day, November 11, current and former military enjoy a Free Meal. Choices include chicken fried steak or chicken fried chicken. Proof of service required. Huddle House: November 9-12, 2018, Active military & Veterans enjoy a Free order of Sweet Cakes (platter-size pancakes) nationwide! Menchie’s: Menchie’s will be giving out free frozen yogurt (up to 6 oz.) to veterans and active duty military all day on Veterans Day, Saturday, November 11, 2018 with proof of military service. Claim Jumper: On Monday, November 12, all Claim Jumper locations will provide veterans with a complimentary meal from a special menu dine-in only. East Coast Wings & Grill: In honor of Veterans day, Veterans and those currently serving in the military stop in and enjoy a FREE MEAL on Sunday, November 11. Meal includes a soda or te and an item from their special select menu. California Pizza Kitchen: In Honor of Veterans Day, November 11, California Pizza is offering all veterans and active military a Free meal from a special Veterans Day menu. Dine-in only. Must show ID, be in uniform, or offer other proof of service. Valid at participating locations only. Newseum in Washington D.C.: This Veterans Day, the Newseum will once again offer Free admission to veterans and active duty members of the U.S. military, plus one guest, during Veteran’s Day weekend (Saturday, Nov. 10-Monday, Nov. 12. Take 5 Oil Change: All active duty military, retired, and veterans (with proof of i.d or service) 25% off any regular-priced oil change NATIONWIDE on Veterans Day, November 11th and everyday! Bed, Bath & Beyond: Active duty military and veterans along with their family members will receive 25% off their entire purchase November 9- 12, 2018, with valid military ID or proof of service. In-store only. buybuy BABY: Active duty military and veterans along with their family members will receive 25% off their entire purchase November 9- 12, 2018, with valid military ID or proof of service. In-store only. Christmas Tree Shops: Active duty military and veterans along with their family members will receive 25% off their entire purchase November 9- 12, 2018, with valid military ID or proof of service. In-store only. Harmon: Active duty military and veterans along with their family members will receive 25% off their entire purchase November 9- 12, 2018, with valid military ID or proof of service. In-store only. Cost Plus World Market: Active duty military and veterans along with their family members will receive 25% off their entire purchase November 9- 12, 2018, with valid military ID or proof of service. In-store only. Home Depot : Home Depot is expanding their military discount to include all veterans for Veterans Day. All veterans and active duty members will receive a 10% Veterans Day Discount on Saturday, November, 11, 2018. Lowe’s: Lowes offers 10% off to all veterans and active duty service members every day by signing up for a MyLowes card. This was a recent change which occurred last year. Sport Clips: FREE haircuts for Veterans on November 11, 2018 at participating locations. October 15 through Veterans Day, November 11, Sport Clips locations around the country want you to help us “Help A Hero” by donating to the VFW’s Sport Clips Help A Hero Scholarship program. Great Clips: On Veterans Day, customers who come in for a haircut at any U.S. Great Clips salon will receive a free haircut card to give to an active/inactive/retired military member of any branch. Veterans can also visit any U.S. Great Clips salon on November 11 to get either a free haircut that day or to pick up a free haircut card to use later. Woodland Park Zoo: The zoo is offering free admission to all active, retired, and veteran U.S. military personnel and their spouses with valid service identification on Nov. 11, 2018. Knott’s Berry Farm: Knott’s Berry Farm is Honoring the Military Community with Military Tribute Days Promotion 2018 Offering Several Different Free Admission Dates for Active, Retired, Veterans and One Guest in November & December PLUS a Discount for your Guests. Harley-Davidson Museum: On November 9-11, 2018, Harley-Davidson Museum® will offer free Museum entry for all active Military, Veterans and their families. SeaWorld San Antonio: Waves of Honor complimentary admission permits any U.S. active duty military, activated or drilling reservist, or National Guardsman and as many as three direct dependents to one complimentary admission per year to either SeaWorld,Busch Gardens or Sesame Place. Omaha Henry’s Doorly Zoo & Aquarium: (waiting verification) In honor of those who proudly served our nation, Omaha’s Henry Doorly Zoo and Aquarium will be offering free gate admission to all veterans and their immediate families on Veterans Day, Saturday, November 11, 2017. The free admission applies to active or retired Veterans and their immediate families. Wildlife Safari Park: (waiting verification) Veterans and their immediate families will receive Free Admission on Veterans Day. 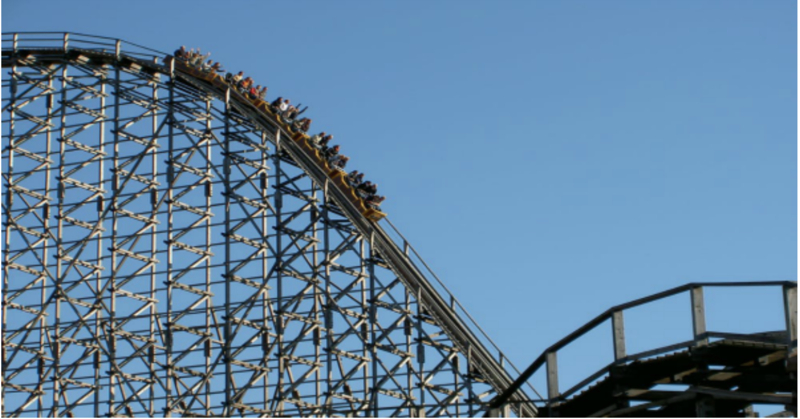 Busch Gardens: Waves of Honor permits any U.S. active duty military, activated or drilling reservist, or National Guardsman to one complimentary admission per year for military personnel and as many as three direct dependents. Busch Gardens Williamsburg will open for the kick off of Christmas Town on November 17, 2018. Military Discounted Tickets available for Christmas Town at your MWR. Learn more details on military discounted tickets here. Thomas Jefferson’s Monticello: This Veterans day Monticello is proud to offer U.S. military veterans FREE ADMISSION to Monticello throughout the weekend November 10-12, 2018. Admission is for the Monticello Day Pass and House Tour. Monticello also offers FREE admission for active-duty military personnel year-round. Jamestown-Yorktown Foundation: will offer Free Admission Veterans Day on Sunday, November 11 to Jamestown Settlement and American Revolution Museum at Yorktown. Upon arrival, please advise the visitor services staff you are a veteran, active duty, reserve or retired military or a family member, show your military ID card, and they will admit you and your children under age 10 free. Any guests without their own ID cards will need to pay regular admission rates. Mariners’ Museum & Park: FREE Military Admission on Veterans Day–Sunday, November 11 • 11 a.m. – 5 p.m. Join us as we commemorate this landmark day in American history. Enjoy costumed interpreters, in-gallery activities, and more! All activities included with FREE Museum admission to Active Duty and Retired Military, Veterans, and their immediate families. Virginia Living Museum: The Virginia Living Museum salutes the service of our military by offering admission and membership discounts year-round to active duty military personnel and their families. Old Town Trolley Tours (Washington DC, Boston, Savannah, Key West, St. Augustine, Nashville and San Diego) will be offering free tours in honor of Veterans Day, November 10-11, 2018, to all veterans and active duty. Mount Vernon: All active duty, former, or retired military personnel are admitted for FREE on Veterans Day , November 11, 2018. There will also be a Veterans Day event. Nashville Zoo: Nashville Zoo and Regions Bank invite active military personnel, military veterans and their immediate families to receive free admission during Military Appreciation Day on Sunday, November 11. Oregon Zoo: FREE admission for military veterans and active military personnel, as well as family members who accompany them to the zoo. Families of deployed military personnel also will be given free admission. In addition, the zoo store is offering a 10 percent discount for veterans, active military personnel and their families, with proper identification. To receive free admission November 11 and 12, visitors must show a military or veteran organization ID, discharge papers or other official military identification; families of deployed military personnel must show an active duty ID. Parking is extra. Northest Trek Wildlife Park: To celebrate Veterans Day, Northwest Trek is offering FREE admission on November 10, 11, and 12, 2018 to Veterans and Active-Duty Military. Immediate family members will receive half-off general admission. Point Defiance Zoo & Aquarium: In celebration of Veterans Day, Point Defiance is offering free admission on Nov. 10, 11, and 12, 2018 for Veterans and Active-Duty Military. Immediate family members will receive half-off general admission. National Parks: In honor of Veterans Day, over 100 national parks will waive entrance fees on November 11, 2018. Virginia Aquarium: Veterans Day Special 50% off admission November 3-11, 2018. Beach and Barton Ford: Located in Hampton Roads, VA, are offering a $1,000* towards the purchase of a new Ford Vehicle. *The $1,000 offer includes any money from Ford Motor Company’s military bonus cash. Rebounderz Newport News, VA: In Honor of Veterans Day, all birthday parties will be 12 percent off on the twelfth. Plus, 50% off on all admissions for active or retired military personnel on November 12th. Wilson Law (Hampton Roads, VA): Free Wills For Veterans! For the month of November, 2018 Wilson Law PLC will be offering FREE SIMPLE WILLS ($500 value). Veterans active duty or retired service members and other local heroes such as firefighters and first responders are invited to visit the firm to legally document their end of life wishes and nominate an executor to oversee their final affairs. There are no obligations, strings attached, and zero requirements to purchase legal services. We simply want to offer our service to say “THANK YOU” for yours! Bonus Veterans Day Gift: Upgrade to a Living Trust and receive a $750 discount should you decide to go forward with any further planning. Patriot Tours & Provisions: 50% off all Yorktown Segway Tours at Yorktown & Fort Monroe to active, retired, and veterans on November 11th by mentioning MilitaryBridge. Guest will need to call/email to reserve this special offer. B&Bs for Vets: Inns and B&Bs throughout the U.S. and Canada will open their doors to thank veterans for their service on or around Veterans Day. New inns and B&Bs will be added daily. PAII member inns may all have vets specials which will be listed throughout the year. Meineke Car Care USA: (waiting confirmation) October 14-November 24, 2017, in appreciation of your service, Military receive up to 45% off select total car care services. Learn more. Until November 23rd, Round it Forward to support Wounded Warrior Project. It’s one way we’re #ServingThoseWhoServed at Meineke. Grace for Vets: Car washes from around the world who join this program offer free car washes to veterans and service members on Nov. 11. Over 2 million free car washes have been given to date. Visit the link to find a participating cash wash.
Meineke: In honor of Veterans Day, at participating locations-For every full priced oil change purchase, we’ll donate $5 to Operation Homefront November 5 – 13, 2018. Also, Free basic oil change for veterans and active duty military November 12, 2018 only. Westgate Resorts: are continuing to honor our U.S. military personnel and their families by giving away 1,500 free vacations to military families. Mark your calendars for November 9, 2018 as they will open up registration for their event that will be held in May 2019. Brides Across America Brides Across America a non-profit– FREE WEDDING GOWNS for Military Brides To Be November 2018. Find a participating location near you, you must register for the events. Bed Bath and Beyond: Active duty military and veterans along with their family members will receive 25% off their entire purchase November 9 – 12, 2017, with valid military ID. In-store only. Dollar General: (waiting verification) In recognition and celebration of Veterans Day, Dollar General is proud to offer current military service members, veterans and their family members an 11 percent discount on all qualifying purchases both in stores and online on Friday, November 11, 2016. The discount excludes purchases of gift cards, phone cards, prepaid financial cards, prepaid wireless handsets, Rug Doctor rentals, propane, e-cigarettes, tobacco and alcoholic beverages. D.A.V. Thrift Stores (Hampton Roads, VA): In honor of Veterans Day, Military members enjoy a 20% Military Discount November 11-17, 2018 in all Hampton Roads locations. Jefferson Lines: To celebrate our Veterans, Jefferson Lines is proud to announce its Fourth Annual Free Veteran Travel on any Jefferson Lines schedule for all active military members and veterans in honor of Veterans Day this November 11, 2018. Veterans and active military members can attain these free tickets anytime between November 1-11, 2018. Free tickets are available for travel departing on November 11th through November 21st for both one-way and round-trip tickets. Veterans and active military members are welcome to return on a different date for round-trip tickets anytime through December 31, 2018. Walgreens: (waiting verification) Walgreens is offering a Veterans Day 20-percent discount to all veterans, military personnel and their family members. On Saturday, Nov. 11, 2017,customers with a Walgreens rewards card and valid military ID or proof of service will receive 20 percent off regular price eligible store items at any Walgreens or Duane Reade drugstore nationwide. Big Lots: (waiting verification) Big lots offers 11% off on Veterans Day with a valid id. 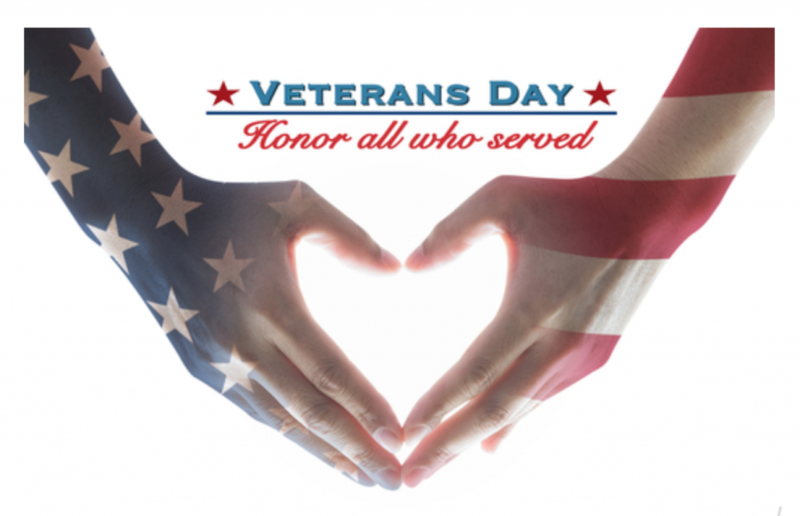 Not only do brick and mortar stores love to honor our military for Veterans Day….many Online Retailers also love to show their appreciation with special online offers. As soon as Veterans Day online discounts become available they will be posted here. 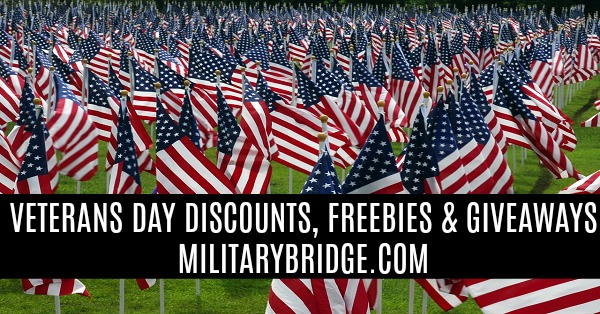 Or, visit our Online Military Discount section for updates on Online Veterans Day Discounts & Sales. Buffalo Wild Wings: (waiting confirmation) Free Wings, 10-12 traditional or boneless wings and a side of fries at participating locations. Chipotle Mexican Grill: (waiting confirmation) Active duty military, Reserves, National Guard, veterans and spouses get a buy-one-get-one (BOGO) deal from 5 p.m. to close on the Tuesday before Veterans Day, Nov. 7. Shoney’s: (waiting confirmation) Participating Shoney’s locations will be offering veterans and active duty military a Free All-You-Care-To-Eat Breakfast Fresh Food Bar from 6am – 11am with a military id. Spaghetti Warehouse: (waiting confirmation) Spaghetti Warehouse, Friday, November 11th through Sunday, November 13th, 2016. Buy one entrée, get one free. Coupon Required (available on their website and FaceBook page on Nov. 4). Choose any of 11 Original Recipe Spaghetti entrées and receive a second entrée free. Friends and relatives are encouraged to treat a veteran to a meal. Hoss’s Steak & Sea: (waiting confirmation) Free meal from a select menu for Veterans from 11am-9pm at participating locations with id. Cheeseburger in Paradise: (waiting confirmation) Veterans and military personnel receive a FREE Veterans Burger with fries on Friday, Nov. 11 with id. Fox and Hound and Bailey’s Sports Bar: (waiting confirmation) Veterans and active duty military will receive a FREE item from the 7 under $7 menu with a military id at participating locations. Village Inn: (waiting confirmation) We’re sharing our heartfelt Thank You to our nation’s heroes, with a Complimentary INN-credible V.I.B. Breakfast at participating locations for all who have served, for Veterans Day. Tim Hortons Cafe & Bake Shop: Active duty military and veterans receive a free donut all day long on Tuesday, Nov. 11. O’Charley’s: (waiting confirmation) Veterans and active duty service members get a complimentary meal from a select menu on Saturday, November 11th, 2017. Free meal can be ordered from the restaurant’s $9.99 menu. Must show a military id. Fatz Cafe: (waiting confirmation) Veterans Day Veterans and Active duty with id can enjoy a FREE World Famous Calabash Chicken Meal from 11am -close with id. Red Hot, & Blue: (waiting confirmation) Veterans receive a free entrée with the purchase of a second entrée on November 9, 10 and 11. Coupon required. Tubby’s Steak & Cheese: (waiting confirmation) Veterans Day, Free small Tubby’s famous sub from 3pm- 6pm at participating locations for active duty and retired with id. Food Lion: (waiting confirmation) 12% off all groceries (some exclusions) for active and retired military personnel with an id and MVP card. Primanti Bros: (waiting confirmation) Free Classic Primanti Bros Sandwich on Veterans Day at participating locations for Veterans and Active duty with id. Calhoun’s Restaurant: (waiting confirmation) Free meal from a select menu on Veterans Day for Veterans and Active military with id. all locations. Macaroni Grill: (waiting confirmation) Free Mom’s Ricotta Meatballs & Spaghetti entrée this Veteran’s Day, Saturday, November 11th to all veterans and active military. Ponderosa Steakhouse: (waiting confirmation)Free Veterans Day Buffet for veterans and active military with id at participating locations. Contact your local restaurant for details. Margaritas – (waiting confirmation) Free entree on Veterans Day for veterans and active-duty military, plus their significant other (up to two complimentary entrees) with id. BD’s Mongolian Grill: (waiting confirmation) First, October 26th – November 12th we will be selling pin-up slips in each of our restaurants. For a donation of $2 you can purchase a pin-up slip and proudly Stand With The Folds; to thank you for your $2 donation we will give you $5 gift card, good toward future food purchases at bd’s Mongolian Grill. All donations will go directly to Folds of Honor. Secondly, on November 9th we are donating 10% of our total food sales to Folds of Honor. Just by dining with us, 11am-10pm you can contribute to the cause. BD’s Mongolian Grill is proud to always offer a 15% Military Discount. Military ID or proof of service required. K&W Cafeterias: (waiting confirmation) Free meal for all who have served with presentation of military ID on Saturday Nov. 11 (11 a.m. to closing). One free meal per ID. Free meal includes entree, two vegetables, bread and refillable beverage. Cattlemens Steakhouse: (waiting confirmation) Free Sirloin Steak meal for Active, Retired, and Veterans with id. Reservations recommended. Dine in only at participating locations. Ruby Tuesday: (waiting confirmation) On Veterans Day, Free appetizer from select menu for Active, Reserve, and Veterans with a military id at participating locations. Perkins: (waiting confirmation) On Veterans Day, participating restaurants will be offering a free Magnificent Seven breakfast to veterans and active military. Since this promotion varies by location, we suggest you contact your local Perkins to find out more. Mimi’s Cafe: (waiting confirmation) Veterans Day, Free entrée on select menu items for veterans and active duty members. Proof of service required. Quaker Steak & Lube: (waiting confirmation) Veterans Day, Veterans and active-duty military members enjoy several specials such as a Free Meal from a Special Menu, Veterans eat free up to a certain dollar amount, and other specials, ask at your location. Chicken Salad Chick: (waiting confirmation) Free Chick Special and drink for veterans on Nov. 10, 2017. Sizzler: (waiting confirmation) Free lunch for veterans and active-duty military with id on Nov. 11 until 4 p.m. to get a six-ounce tri-tip sirloin steak, Malibu Chicken or six jumbo crispy shrimp with a choice of side dish and beverage at participating locations. Beverage choices are coffee, iced tea or a fountain drink. Dine-In Only. Bonefish Grill: (waiting confirmation) On Saturday, November 11, all active and retired service members with a valid military ID will receive a free Bang Bang Shrimp. Cicis Pizza: (waiting confirmation) Free pizza buffet with a military id. an iced tea or soft drink, dine-in only, on Veterans Day-Saturday, November 11, 2017 at all Red Hot & Blue locations. **MB recommends calling ahead to verify discounts and freebies for Veterans Day 2018. Some offers are on Veterans Day, November 11, while others are when it is observed on November 12. Other offers are several day celebrations or for the month of November. MB has done our best to verify all offers but some are specific to participating locations due to franchises. It is always best to call ahead first to verify your particular location to make sure they are participating. We also strongly recommend calling restaurants ahead to see if you are able to make a reservation as those that take them book up very quickly. Remember to bring proof of service as most will require this however some may go on the honor system. Proof of service can include: a Military ID Card (active/reserve/retired), DD214, discharge paperwork, Current Leave and Earnings Statement (LES), Drivers License with Veterans Designation, Veterans Organization Card (e.g., American Legion and VFW), or other form of identification. You can also now receive your Veterans ID Card showing proof of service from the Department of Veterans Affairs. If we missed any Veterans Day Offers please feel free to email us at [email protected] and we will be sure to get them added. 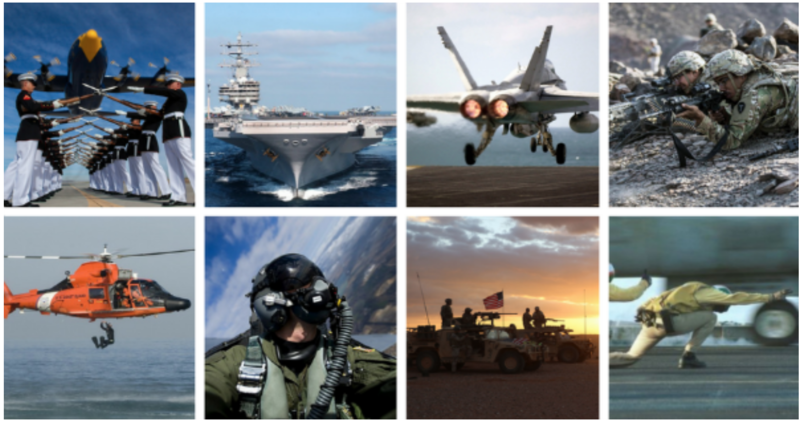 MilitaryBridge is an Online Review & Resource Platform for Military Members and Their Families. MB has launched several new features to better serve the military community due to a lack of resources in the PCS process. Military members and their families now have a place where they can read or leave reviews on best businesses, services, apartments, military housing, neighborhoods, schools, and military bases. You can help by leaving a review on a business listed or recommending a great business/service that has helped you out. We are all in this military life together so it’s important that we help one another out! MB will still continue to share what we were founded on and that is Military Discounts. MB provides a resource to learn about local, national, and online military discounts and appreciation offers. We also continue to grow our military resources such as military related non-profits, important military websites, and military bloggers sharing information from all aspects of military life. Sign Up Today To Start Reviewing or Recommending in Your Community. Thanks for being a part of The MB Community! Veterans Day Offers will be added as they continue to come in…Follow us on Social Media or our Newsletter/Blog to keep up to date with the latest discounts, freebies, and events for 2018! ** Milspousefest.com, MilSpouseFest and its parent company Lafayette Media Group are a separate entity and are not the sponsors of the giveaway prizes or promotions. The Sip: Oh Boy. You’re gonna want to see this.